European governments started to thrash out a plan for close ties with post-Brexit Britain on Monday in the last week before they gather to sign their divorce papers. ‘A painful week in European politics is starting,’ Austrian minister for Europe Gernot Blumel, whose country holds the rotating EU presidency, told reporters. ‘Now that there is a concept withdrawal agreement we think that it is satisfying, it’s workable, and we will invest our energy now in the political agreement,’ Dutch foreign minister Stef Blok said. Ministers arriving at Monday’s meeting would not be drawn on this. ‘It’s still open,’ Blok said. 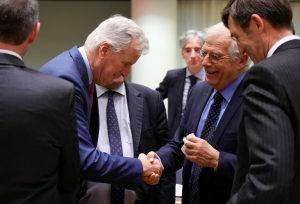 Blumel said 29 March is set as Brexit day and the withdrawal will be approved as is on Sunday, while the political declaration would seek ‘as close a relationship as possible’. In the meantime, EU Council president Donald Tusk is going ahead with plans to bring May and her fellow leaders together on 25 November to sign the deal. ‘We now have an intense week of negotiations ahead of us,’ May will tell British business leaders on Monday, according to Downing Street. ‘During that time I expect us to hammer out the full and final details of the framework that will underpin our future relationship,’ she was to say. Publicly, they refuse to intervene in Britain’s affairs, but privately they insist both sides ‘exhausted their margin to manoeuvre’ in the divorce negotiation. ‘Of course both sides have to pass parliament. It goes for the UK but it also goes for the Europeans,’ Blok said. ‘So this political declaration really lays the foundation of our future relationship, it has to be ambitious,’ he added. But grumbles remained behind closed doors because, in the words of one European diplomat, the ambassadors agreed not to pour oil into the British fire’.